I’ve been interested in World War II since listening to my uncle’s tales from his experiences in the European Theater. I couldn’t get enough of it, and when I finally decided on a profession, I became a history teacher. My uncle was a sergeant in the 4th Armored in Patton’s 3rd Army and fought in the font lines across Western Europe from D-Day+10 through the Battle of the Bulge, when he was sent home with a serious illness. One of the terms I remember him saying was “draggin’ wagon”. At least that’s what I thought I heard. You know, “draggin’”…like a tow truck. 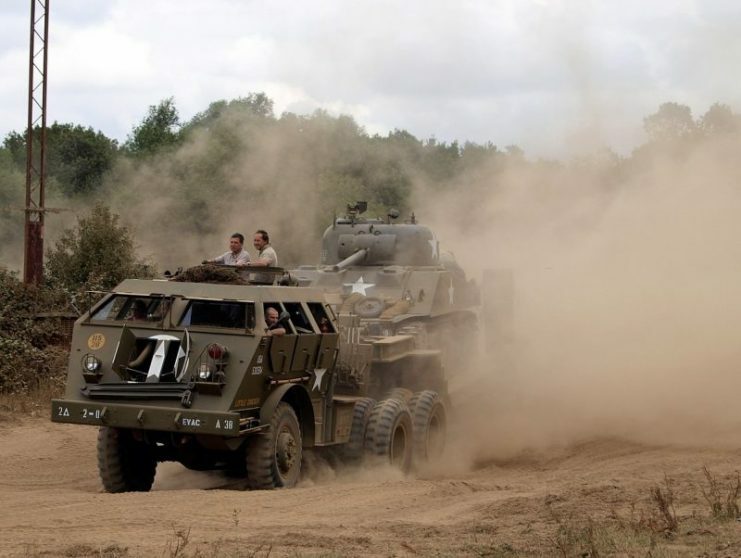 The wagon towed tanks and other heavy military vehicles during the latter part of the war. I never questioned the name until years later, when I became a real WWII nerd, and started building armored vehicle models from the era. 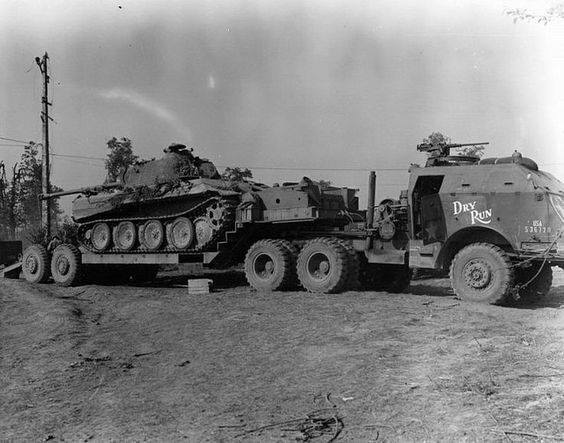 So, many years later, I learned that the M26 tank transporter/tank recovery tractor was actually called the “Dragon Wagon” when I was searching for a large vehicle model to add to a diorama I was putting together. 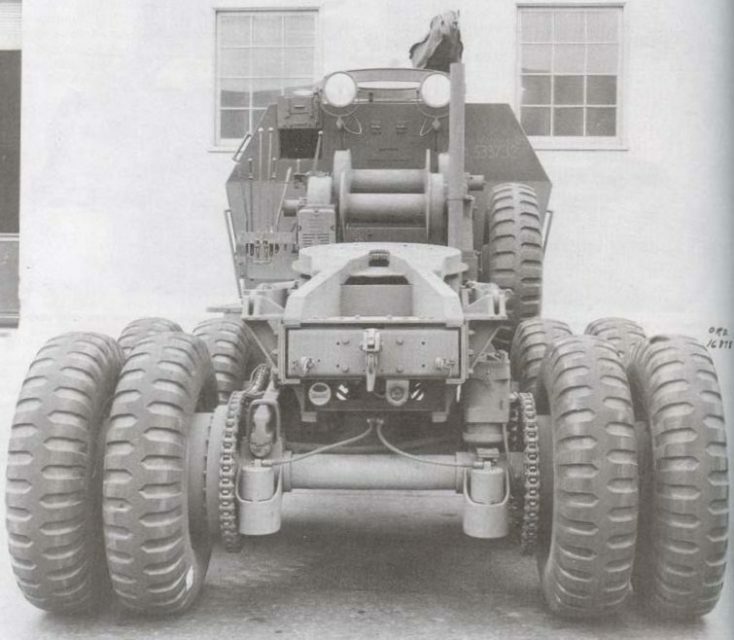 M26 tractor prototype, front view. “Dragon” was not a play on words for “dragging” or towing something. Had nothing to do with the vehicles purpose, but everything to do with the flames that would periodically burst forth from the trucks mighty exhaust. The M25 was the original designation for what became known as the M26 in the latter part of the war. The trailer that was paired with the M26 was the M15 trailer. The Dragon Wagon replaced the smaller M19 truck/trailer combination built by the Diamond T company. The new vehicle was built by the Pacific Car and Foundry Company, now known as PACCAR, Inc., which owns such famous truck brands as Kenworth and Peterbilt, as well as others. The trailers were built by Fruehauf. As American tanks got bigger towards the end of the war, a new more powerful transporter was needed. 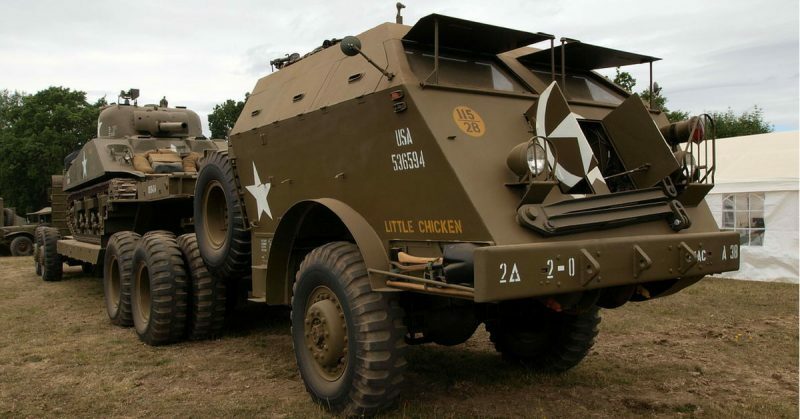 The Dragon Wagon carried a seventeen liter 240 horsepower Hall-Scott engine with chain driven tandem axles and was capable of towing 80,000 lbs/40 tons, which was more than enough to carry the newer Sherman tanks. Upgrades to the engine at the end of the war and in the Korean War allowed the vehicle to tow the heavier Pershing tanks that the US deployed at the very end of WWII. The truck/trailer combination was approximately sixty-four feet long (truck 25’4”/trailer 38’5”). The truck was eleven feet high, and ten feet wide – a monster. What made it really unique was its modern design: the Dragon Wagon would look at home on today’s battlefields with its sloped armor (front 19mm/sides and rear 6.4mm). 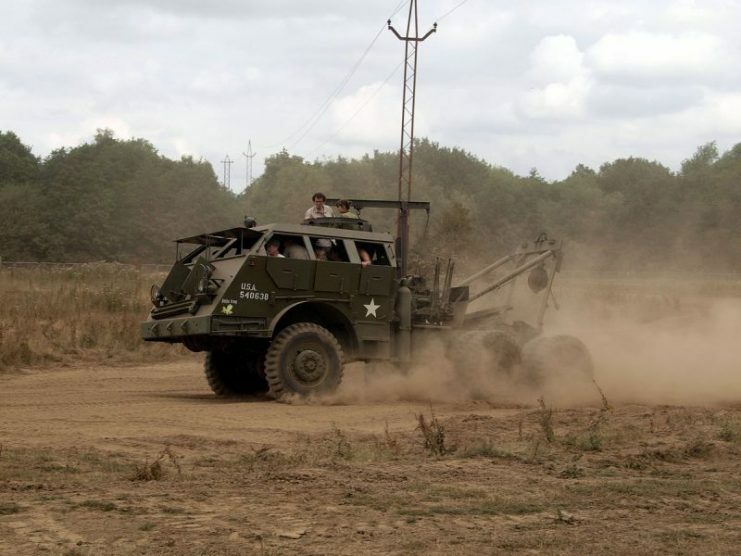 This differed greatly from previous military towing vehicles, which were not armored at all. 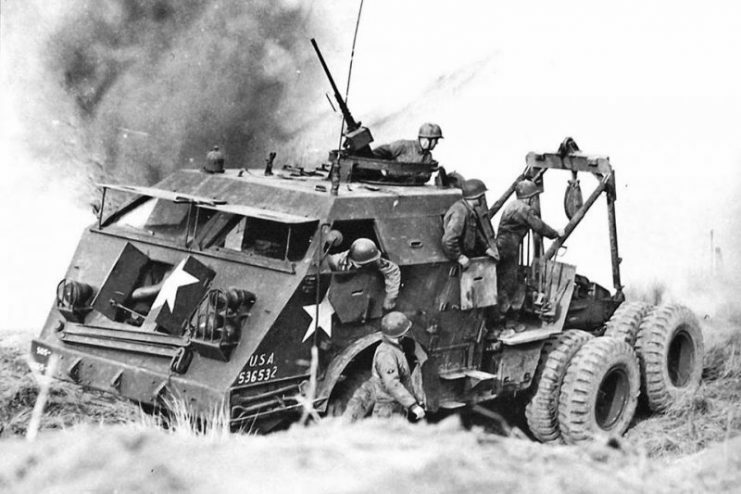 Additionally, the M26 carried a .50 machine gun for self-defense. The truck carried a crew of seven in a very hot, loud and uncomfortable cab. It’s armor and machine gun along with the need for getting broken down tanks repaired meant that the crew had to be prepared to go right into the front line area under fire. 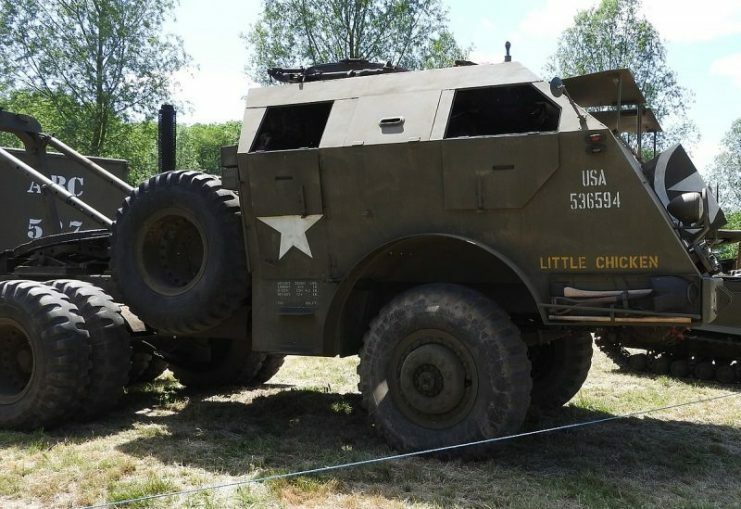 By all accounts, the M26 was able to sustain a moderate amount of damage and keep on truckin’ – literally, and the engine was dependable in all weather conditions, but it was not an easy vehicle to drive. The other six men were frequently not only mechanics, but guides for the driver on the very narrow roads covering most of Europe during the war years. The vehicle also served in the Pacific, notably on Okinawa. M25 “Little Chicken”. Photo: Rob Mitchell. Production of the Dragon Wagon ceased in 1955. 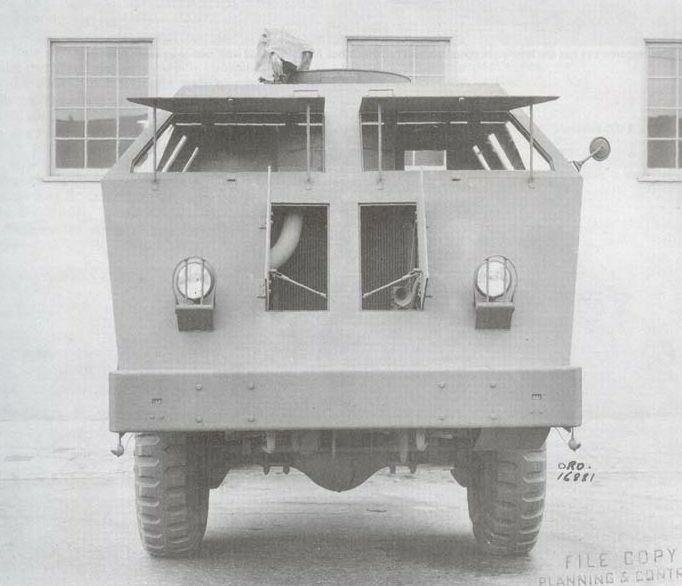 Two thousand one hundred Dragon Wagon’s were built, in two variants, the M26, and the M26A1 (which was unarmored). Many of the vehicles went to private ownership, but they were not practical for anything but heavy vehicle towing in very limited areas (such as towing train cars). Highway driving was out, as the truck had a top speed of only twenty-eight miles per hour. However, some of the trucks later went on to serve their country again, hauling parts of Saturn rockets for NASA during the Apollo Program.